HIMSS is a non-profit organization that provides thought leadership, community building, professional development, public policy, and events to improve the quality, cost-effectiveness, access, and value of healthcare through IT. 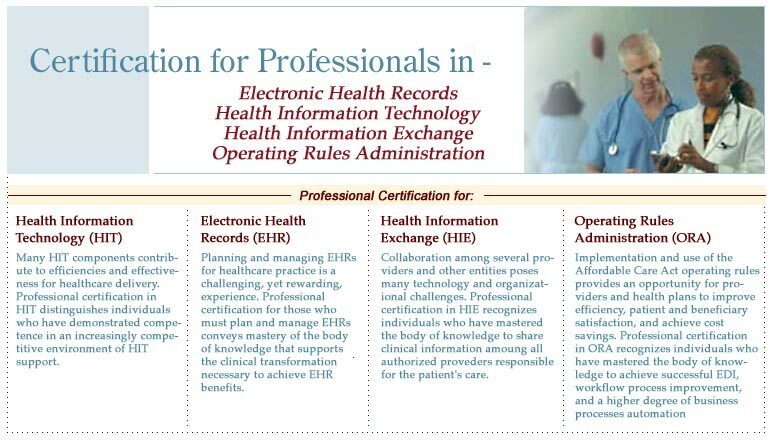 HIMSS will maintain the CPHIT, CPEHR and CPHIE professional certifications through December 31, 2018, and offer certification holders the opportunity to transition to the HIMSS Certified Professional in Healthcare Information and Management Systems (CPHIMS) certification. Contact JoAnn Klinedinst, M.Ed., DES, PMP, CPHIMS, FHIMSS, HIMSS Vice President of Professional Development, for details on the process, at jklinedinst@himss.org. Health IT Certification, LLC satisfied an important training and professional certification industry need during the time when healthcare was transitioning from silo'd health information systems to the significant use of EHRs and HIEs throughout the industry. This transfer to HIMSS provides the opportunity for those with one or more professional certifications from Health IT Certification, LLC to continue to be recognized with the CPHIMS professional certification. Those students holding the CPORA from Health IT Certification, LLC may continue to utilize the credential if they choose. Health IT Certification, LLC hopes that those who continue to use their CPORA designation will uphold the principles of professional practice through continuing education on their own after the designation's expiration. For the complete, up-to-date list of Certified Individuals, click here.